Bill of sale form is a particular paper that handovers the ownership of goods from one person to another. When you buy any kind of goods, a legit transaction takes place with a few papers to sign. 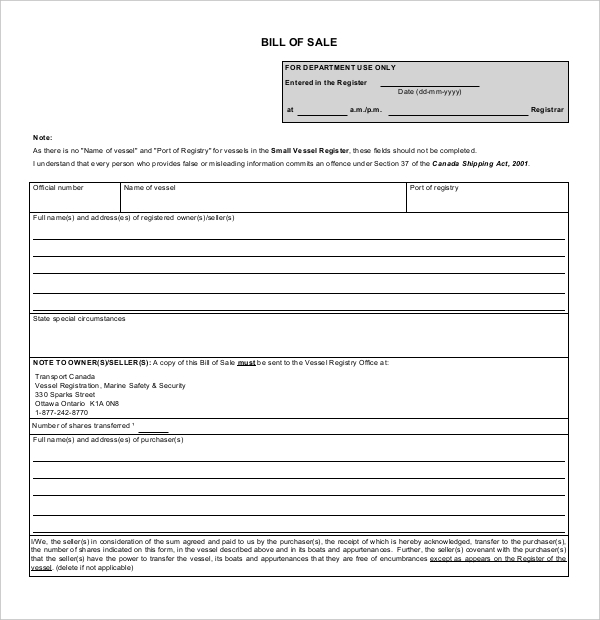 Bill of sale Form usually comes for various items like vehicles, motorcycles and boats. 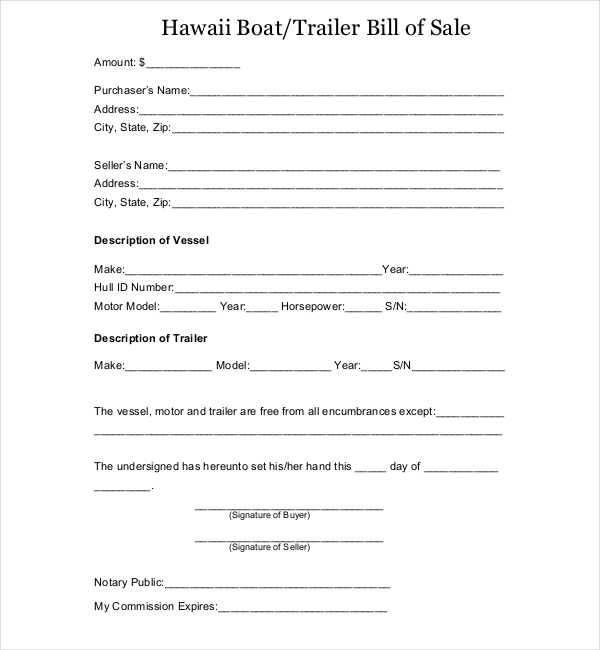 Boat Bill of Sale forms are for those who are interested in buying or selling vessels/trailers. 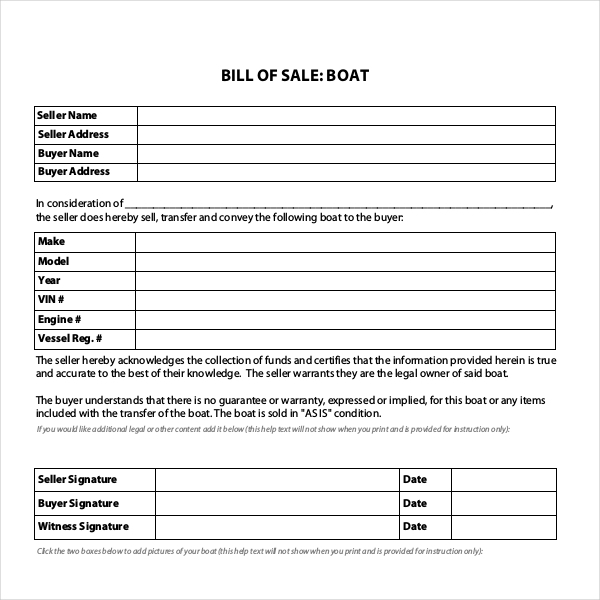 There are Different Types of Boast Bill of Sale Forms That can be Used for Buying/Selling Boats. 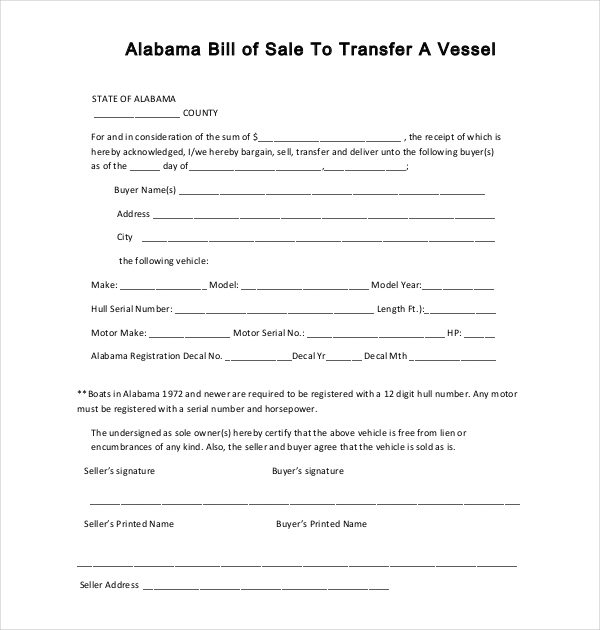 The Alabama boat bill of sale form is used for transferring the ownership of a vessel in the state of Alabama. This form has to have the model number, registration number, motor make, serial number of the motor and decal information. 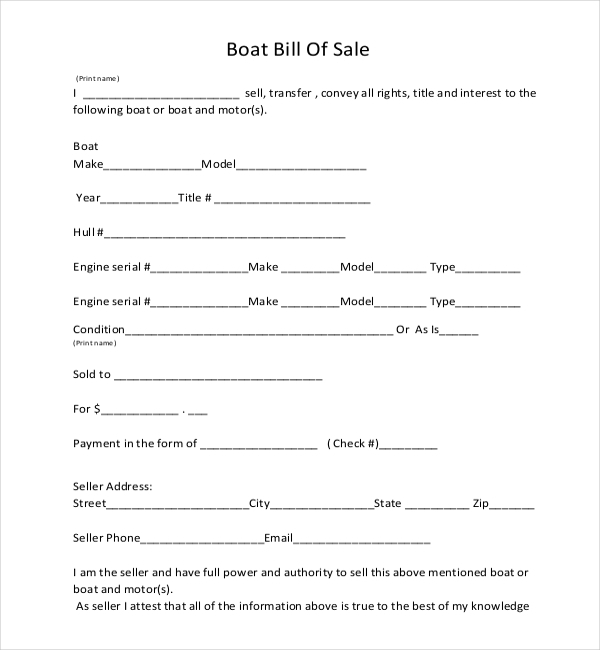 This form is a very basic one for buyers and sellers of the boat. Apart from the important information of the buyer and seller’s identity, there are spaces to fill information about the boat. Anyone who is interested in buying a boat should be interested in such forms as this is a proof of owning the vessel. The Colorado boat bill of sale form is for those who are interested in owning a vessel, outboard motor or a trailer. The description of the vehicle interested is mentioned in the form along with its value and buyer’s and seller’s information. 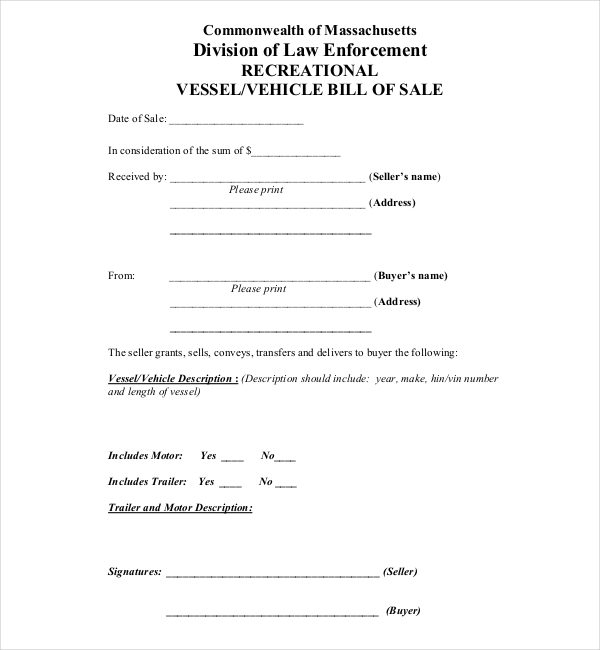 If buyers are interested in a vessel, they must use this form. This is for transfer of ownership of vessels in Canada under the Canada Shipping Act, 2001. Any false information in such forms will directly lead to an offence under the mentioned act. A witnesses’ signature is also required and a copy of the forms must be sent to the Vessel Registry Office situated in Canada. The vessels that have been principally used in Florida, and that the person needs to buy it will have to use these forms. All of the details regarding the vessel will be stated in this form. The purchasers and the seller need to fill these forms as a formal step towards owning the vessel. This form is a very basic and general form for transferring the ownership of the boat to the buyer. It is a common kind of form that can be used for all boats. Simple information about buyers, sellers and description of boats are to be filled in here. Anyone who is interested to buy a boat which is registered in Hawaii need his form. It caters to the buyers need for having got the ownership of the vessel. This form can be used to deal with trailers as well. Any missing information seen will not be accepted by the officials. The boats that are registered in Kansas and the buyers are interested in such boats need to get this form. 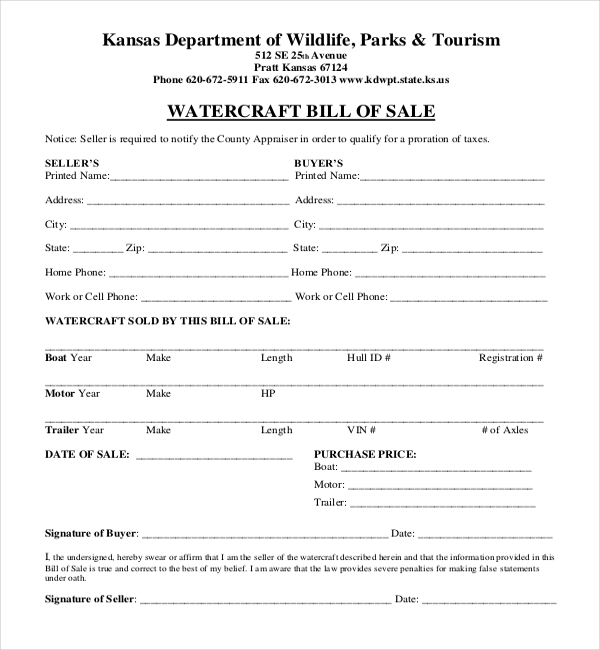 The Kansas boat bill of sale form leaves a proof that there is a paperwork done while dealing with vessels/boats. You can get this form in a Word or PDF format. 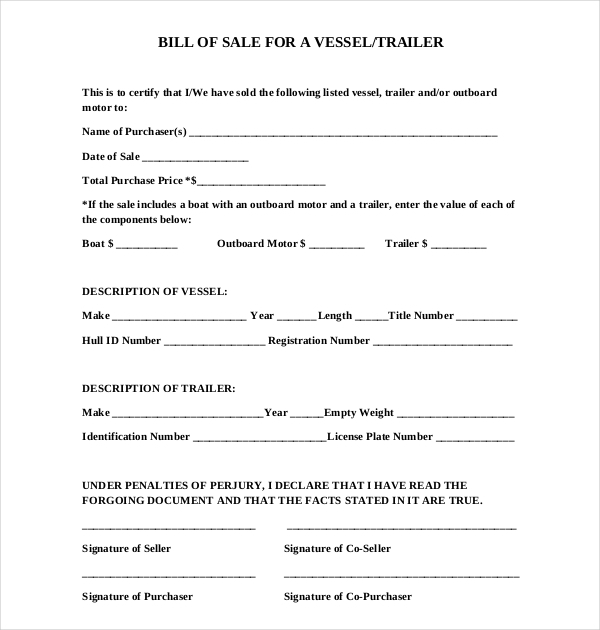 This form is a generic one that has to have information of the trailer or the vessel in question. A fair description of the vessel or trailer is given like the model number, registration number, serial number etc. Many people like to own a watercraft for seaside business or water adventure. 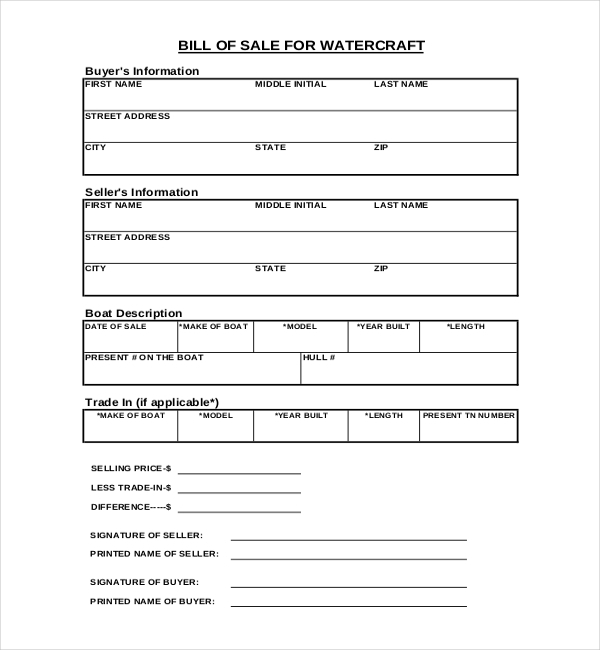 If a person wants to own a watercraft, then he/she might be interested in getting this form along with the purchase. A selling price and a trade-in price must be mentioned along with other important details. 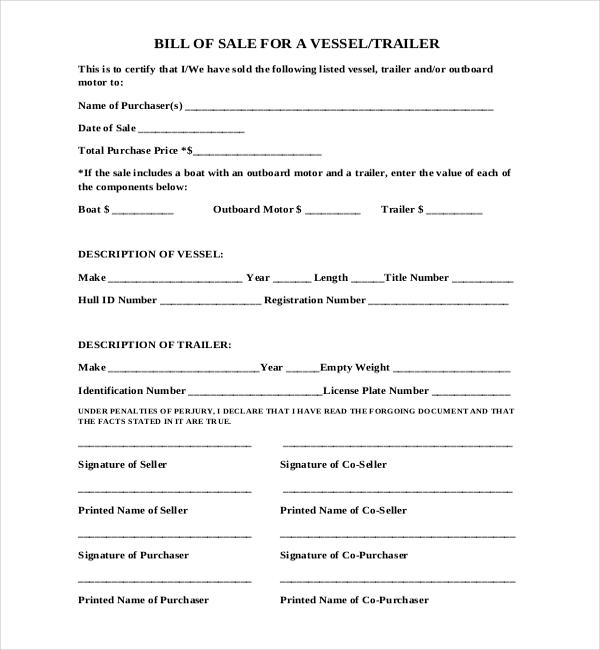 People who are interested in possessing a vessel/trailer/motor need this form for ownership purposes. The owner maybe a citizen of the country and this form is a significantly important document as the buyer/seller details along with vessel/ motor/ trailer report and value is present. Vessels that are registered in Georgia and are being sold to another person(s) will need this form. 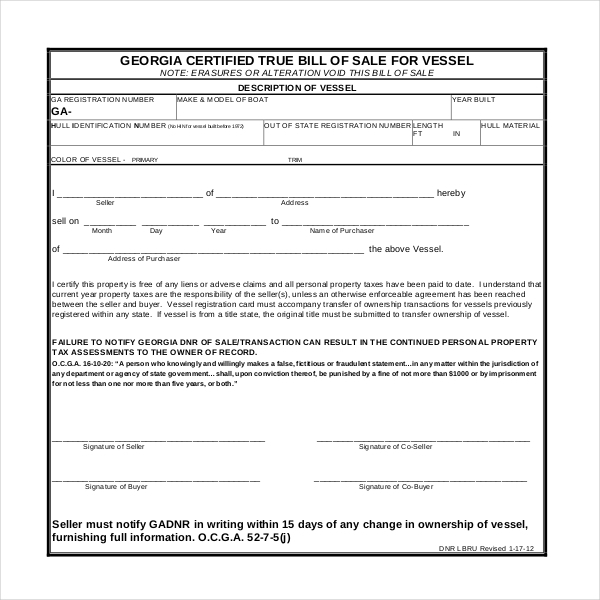 The Georgia boat bill of sale will have the description of the vessel along with seller and buyer details. 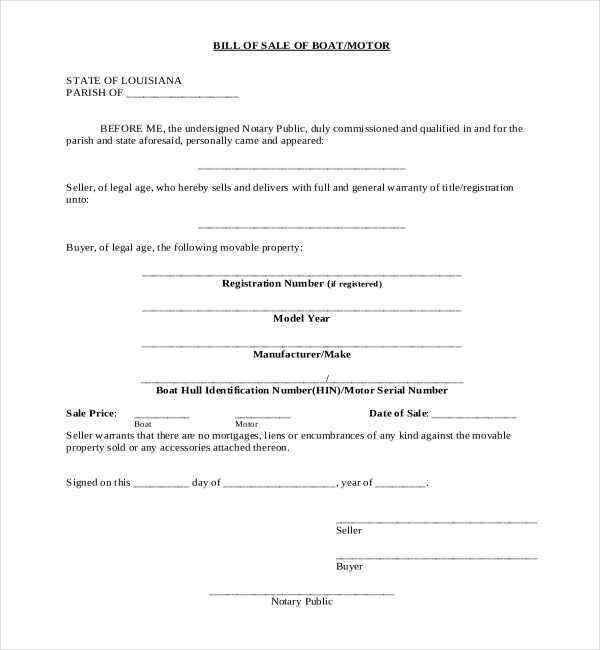 The bill of sale of boat of Louisiana is for those who are keen on owning a vessel/motor under the state of Louisiana. These forms are essential when a transaction of any vessel is taking place. 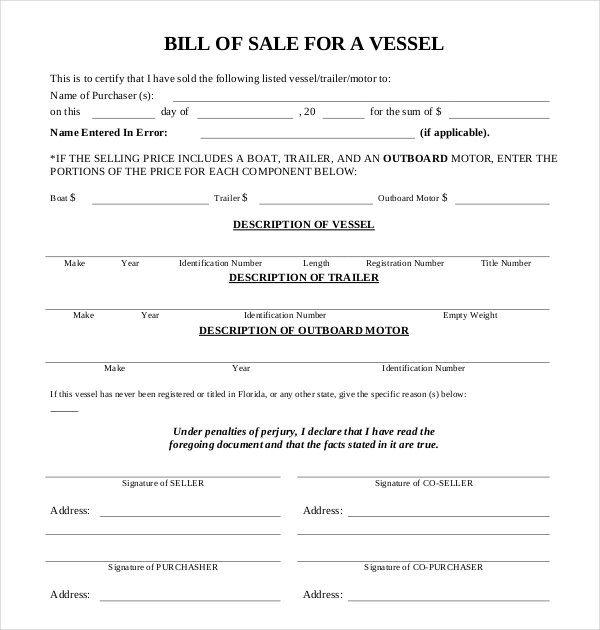 Like all other bill of sale form, this is a form that needs details about the vessel. The signature of the buyer and seller is mandatory. The sample bill of sale for boats is to be handled with care as this is important for transaction of vessels. The form gives information about the vessel, the seller along with some other details like selling price etc. are commonly required while a transaction takes place. 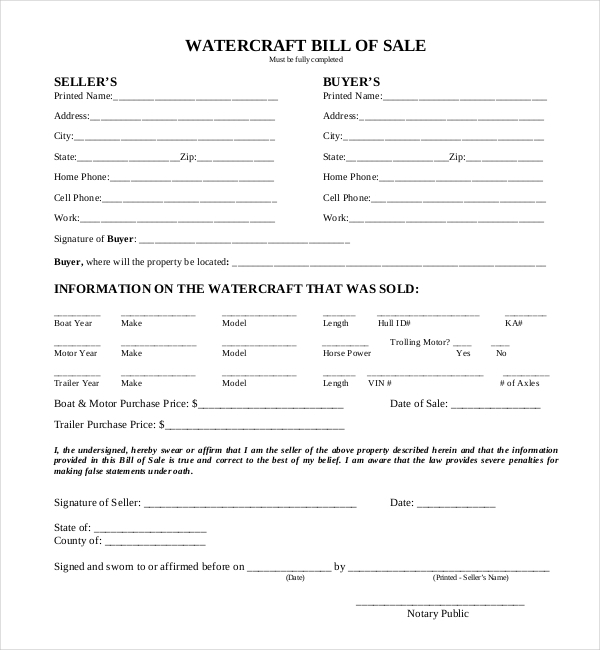 A watercraft bill of sale form is useful for people who did like to own this vehicle for their personal or professional use. The form gives the details of the transfer of ownership to the buyer. Any omission in the details can be subject to questionable matter. Hence providing all the details will be mandatory unless specific instruction given. Boat bill of sale can be used as a proof in court in case any incident relating to the vessel takes place. These forms act as a contract between the buyer and seller if correct information and execution is done properly. It is legally binding the signers related to the document and is an excellent way to protect their legal rights. Any legitimate form has to have all the details, which has to be true in nature. If the seller gives false information, he/she may be liable to criminal offence under the respective state the boat is registered for. Making a copy of such form would be a wise step. Having a copy will keep you in a safer side. Ensure that all the original documents are there for the transaction of boats. Witness information is usually required in all forms. One needs to make sure that the witness is not biased during the whole transaction in any form. The buyers must read the form carefully. They have the liberty to ask any questions regarding the form if misunderstood or if information missing. The buyer can ask for legal documents relating to the Boat to ensure if the seller is the rightful owner of the vessel or not. Having a bill of sale makes the life of both buyers and sellers easier as the paperwork is done for the vehicle in question. As-is protection will be there. He/she would have proof of ownership which will help in any court case relating to the boat. Warranty information will be secured. A valid date of ownership transfer will be there with the buyer. Forget the old methods of buying a form from a registry office and filling them up. It is quite time consuming. You can get hold of all the forms through our website. We will give the finest quality forms which are downloadable and printable as well. They come in both PDF and Word document format, so you can choose accordingly. We have the forms that are compatible for all the versions, be it higher or lower. These forms are delivered error-free and have a high success rate. In case you need customization of the forms, we will be happy to help you to fulfill your needs. You are just one click away for getting the forms in your hands. 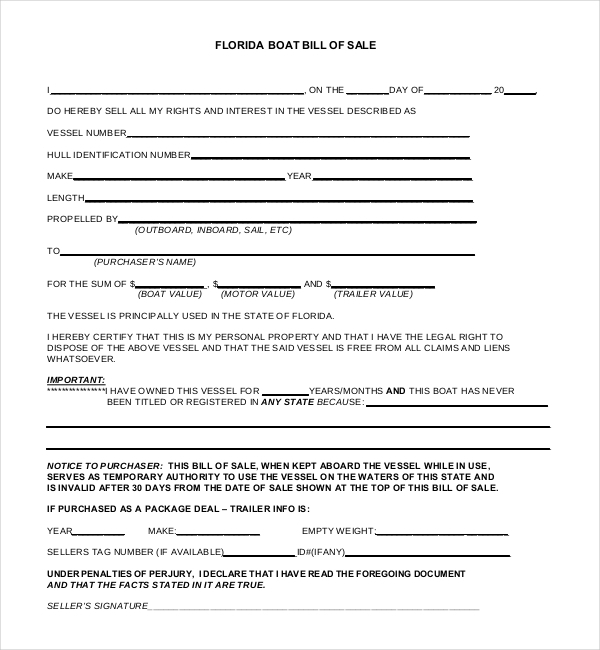 The Boat bill of sale gives a proof to the owner of his/her ownership. This is a vital paper to show in a court of law to validate ownership of items like boats and watercrafts. Relevant information like contact number, payment methods and warranties are also mentioned in such forms for keeping records.